O dear, My boss isn’t well. I haven’t been well. A friend mentioned he’s been under the weather for a while. 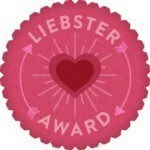 Cold season blues can really affect our bodies! When I feel this way-runny eyes, sore throat, I long for my grandmother’s soup. Lightweight, packed with spices, this cold medicine soup is bound to pick you up too. I paired it with some steamed and sautéed beets, tamil Brahmin style. You have to give it to our ancestors, they knew how to enjoy the good life. And food is such a big part..of life..Don’t you agree, people who enjoy and relish food, really live life!! Finally a thought on protein since neither the soup, nor the rice, nor the beets are going to satisfy the protein brigade. If you have a guest that needs protein, then just cook some papad in the oven. I enjoy the crunchy texture of papad whenever I make soup.. it’s a must side. 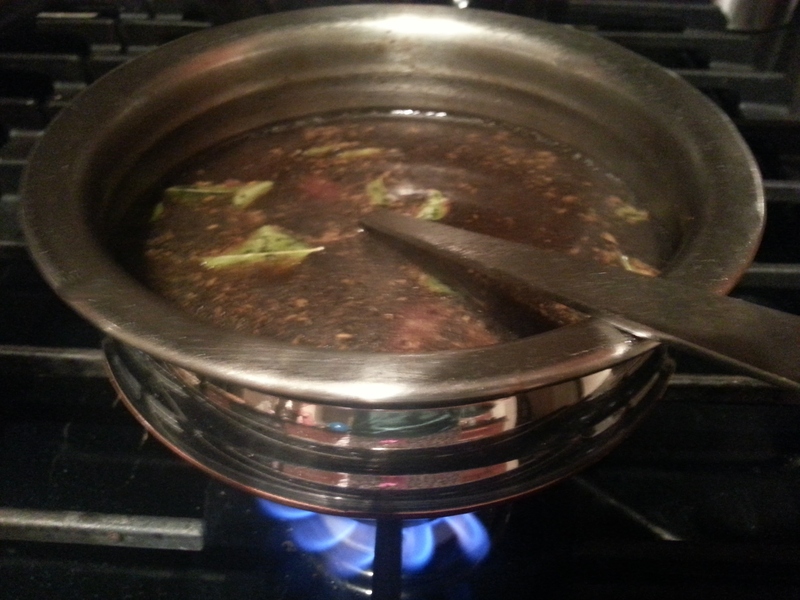 • Immediately pour the tamarind water into the pan. My sinuses got completely cleared. 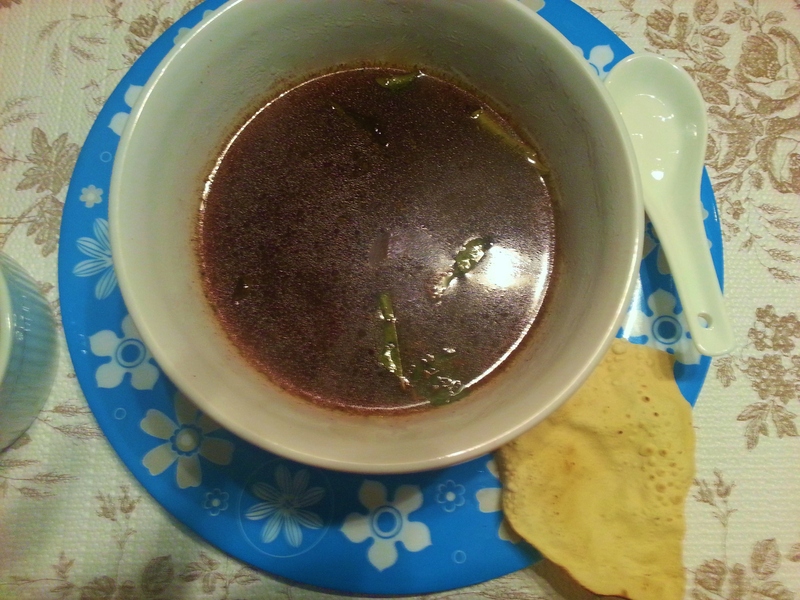 The healing and warming spices in the soup cleansed me. I’m now ready to fall asleep. Years ago we would get together with another family almost every Sunday for breakfast. One time I prepared channa masala with chapatti(flatbread) before tennis & heard the words ‘I played a great tennis today, felt so strong & fortified. I was hitting those volleys like never before’. Channa masala does that with its high protein. There are as many ways to make channa masala as there are people in India 🙂 I hope you like my delicious, low fat way which will have you mindfully use just a few spices. Wash chickpeas in water using a fork not hands to stir water. Soak overnight or for 8 hours completely immersed in water. SOS I’ve never used canned chickpeas, but ..you can use canned if in a rush, but be sure to thoroughly rinse out water, there’s a lot of talk about BPA in aluminium cans. RInse out the water and add fresh water. Pressure cook chickpeas till soft. Crush some of the chickpeas to a paste and leave most of them whole. SOS The paste is what’s going to give your channa masala its oomph! Set aside. Dry roast coriander seeds. When you smell the aroma, remove from stove. 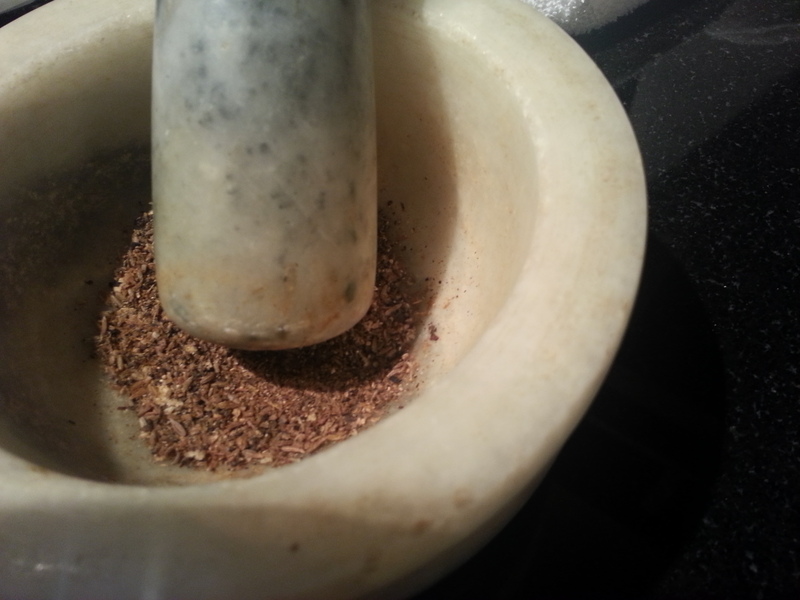 Grind to powder when cool in food processor or coffee/spice mill. Set aside. SOS I typically prepare my spice powder once a week so its still fresh when I use in my daily cooking. Heat oil in frypan. Quickly add hing and cumin. Add ginger, garlic, sauté quickly. Then add turmeric, cayenne and roasted coriander powder and toss everything together. Add cooked chickpeas to the pan and the tamarind paste. Let everything come to a boil & raw smell of tamarind is nicely mingled with the chickpeas and spices. 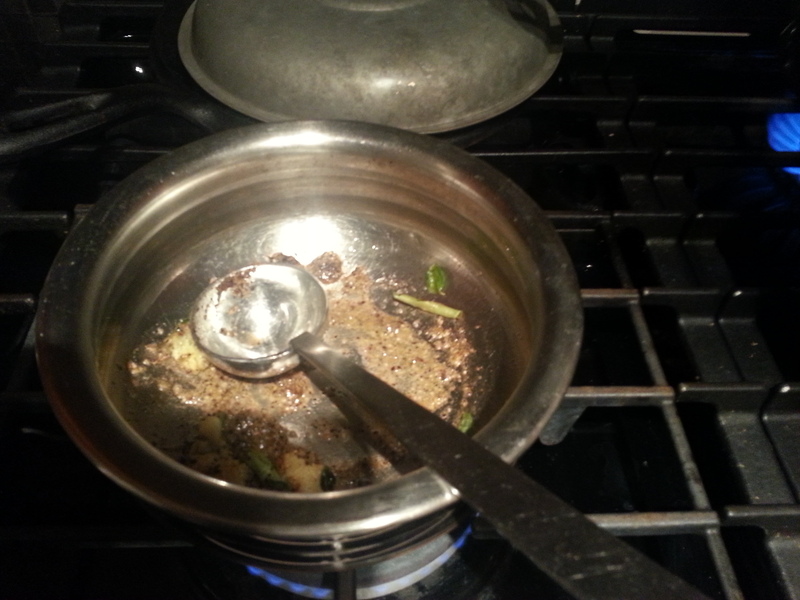 Add salt to taste and remove from stove. Serve garnished with chopped cilantro, onion rings, chopped green chili and even sliced tomatoes. 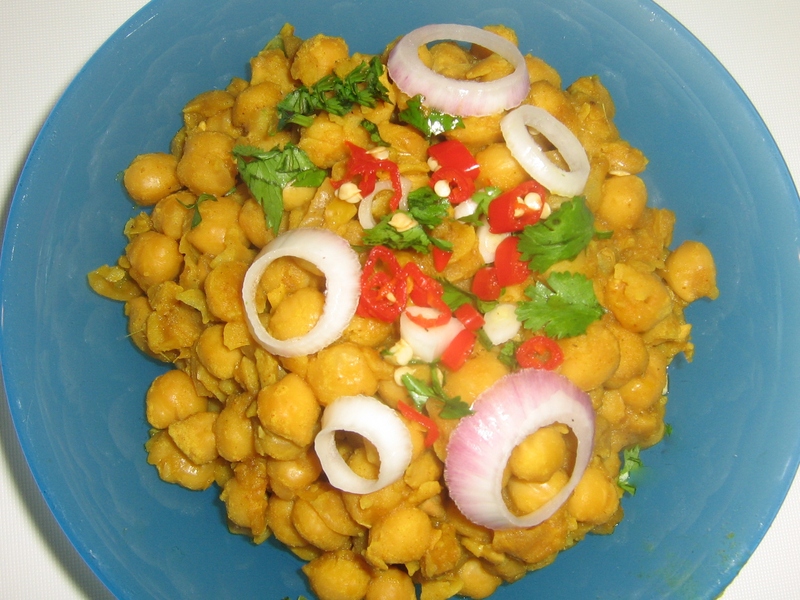 High in fibre and protein, chickpeas fill you up and stave hunger. They’re good for your heart too. Including 3/4 cup (175 mL) of chickpeas in your diet each day can help lower LDL (bad) cholesterol levels, which reduces the risk of heart disease. The spice for today is tamarind. Its a pity that its not used enough since there isn’t much awareness about usage.. Its rich in minerals. Once you begin to play with tamarind, its sweet and sour taste will definitely have you hooked and balance out and nicely complement all the hot and spicy foods you’re reading about in my blogs. Channa masala is typically served with deep fried bread called bhatura. But I’ve had equally tasty roadside vendors in delhi serve it with kulcha(a baked bread popular in Punjab and Pakistan). You can even serve it with store bought nan, ligthly toasted in the oven. 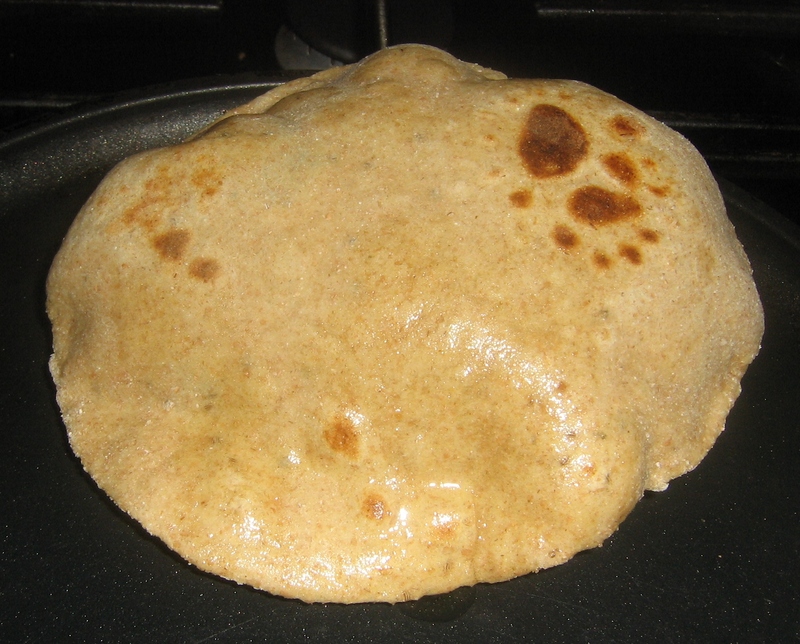 I’ll often serve it with chapatti(flatbread) –here’s a nice pix of my chapatti puffing up on the griddle. But my best memories of channa masala is a pairing with rice that I once ate in Sarojini nagar market in delhi after a long day of shopping and bargaining. The rice and protein kick energised me so much that I was able to get back on my feet for a second shopping round! This is why I highly recommend the rice pairing –use any rice, short or long grain, just as long as its not sticky rice for this recipe. 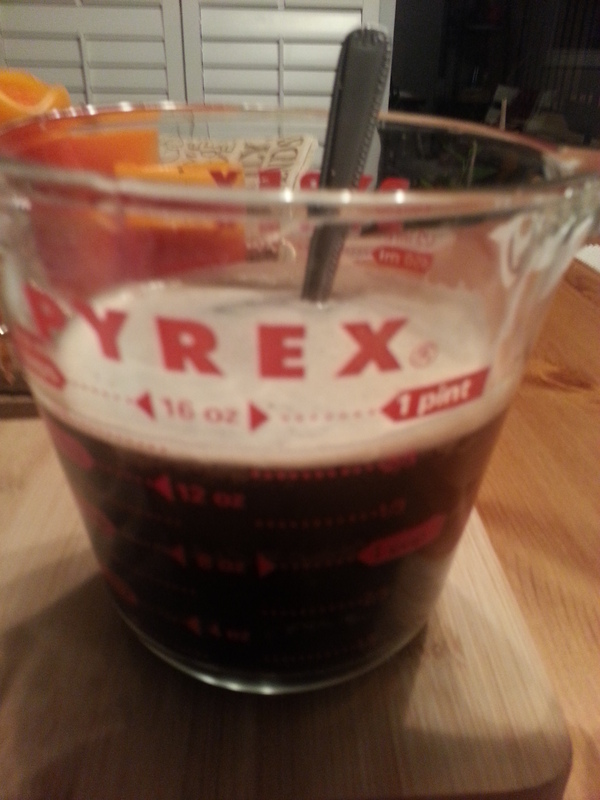 I hope you enjoyed my recipe. I’d love to hear what you use in place of tamarind for sweet and sour tastes!